I’m almost at a loss here because I could talk in wild rambling circles about my experience of meeting Richard Paterson in Las Vegas at the Nth event recently and sharing a cigar with him and the new upcoming re-release of The Cigar Malt by Dalmore. There are some things that defy words, or maybe the right vocabulary just escapes me, whichever, this is simply a whisky you must own if you smoke cigars and consider yourself a scotch drinker. So there was once, The Cigar Malt, then, because of a mis-perception of what the scotch was all about (people actually believed they put tobacco in the scotch) they renamed it, The Gran Reserva. Well, then cigar smokers who enjoyed it said, WHAT they HEY! Where did it go, well, nowhere actually. So, I do not have the final marketing notes yet but rest assured that The Cigar Malt will find its way back onto this wonderful whisky. In the meantime, The Gran Reserva isThe Cigar Malt. Make sense? Well just go buy it. Damn. In Michael Jackson’s Complete Guide to Single Malt Scotch it is described as a “complement rather than a contrast” to a cigar. If you are not sure what that means, fire up a cigar and pull out an Ardbeg Corryveckran and you may get it. Please, only choose this combination if you know what you are doing. You might want to have a side of bacon ready. If you are an Ardbeg fan, you know what I mean! The Gran Reserva whisky is comprised of a blend of single malt highland whisky’s between 10 and 20 years old. It, to me, is as balanced as a complex whisky can get. And surprisingly this is not an $80 USD whisky but drinks much better to me than some that command that price. I tend to favor a medium to full cigar that delivers good flavor. I tend to always like a puro Nicaraguan cigar but am surprised by some blends with the Nicaraguans also. This whisky may drown out a light cigar like a Montecristo #2 or Macanudo but certainly would be a better experience than a Glenlevit or Johnny Walker (pick a color). I put that in there for those who actually like tasting notes, I’d describe it as frickin perfect! As Richard would say, Slainte Mhath! 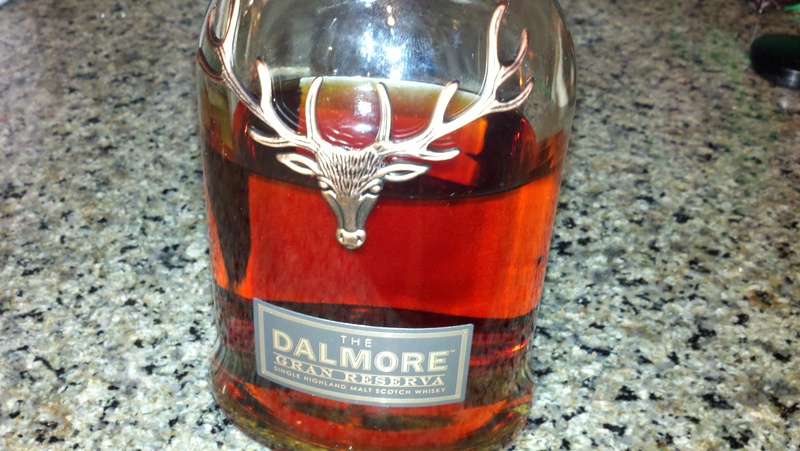 I use to drink Dalmore a lot, I have not in a while though. I have not had the newest cigar malt offering because they raised the price too high.